After its glorious summer last year (the most Instagrammed pop up of summer 2016? - we think so) Pergola on the Roof is back. This time the rooftop food court on top of a car park at BBC Television Centre is bringing a slice of Long Island living to Shepherd's Bush. Done up to look like The Hamptons, the al fresco food court also brings in new restaurants with Breddos Tacos joining Patty & Bun, 8 Hoxton Square and Bonnie Gull spin-off 'Salt 'n' Sauce'. With white-washed decking, palm trees and thirteen person day-beds, it's the perfect place to enjoy summer in The Hamptons without leaving London. 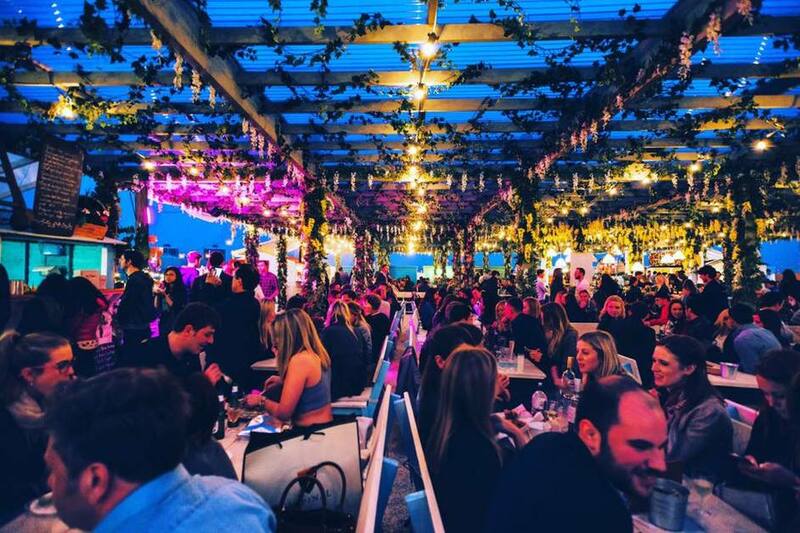 What are the best dining options near Pergola on the Roof London? Pergola on the Roof gyms, sporting activities, health & beauty and fitness. The best pubs near London Pergola on the Roof. Pergola on the Roof clubs, bars, cabaret nights, casinos and interesting nightlife. Where to have your meeting, conference, exhibition, private dining or training course near Pergola on the Roof. From cheap budget hotels to luxury 5 star suites see our special offers for Television Centre hotels, including K West Hotel & Spa London from 91% off.